Regardless of what mediums are in your content marketing arsenal: mobile marketing, social media marketing, email marketing, direct mail, outdoor, and on and on - "branded content has the ability to create brand differentiation by bridging the gap between TV’s emotive power and digital media’s efficient reach." The reason for the quotes is that line comes directly from a recently-released Forrester report entitled How To Build Your Brand With Branded Content. Penned by Forrester Research Principal Analyst Tracy Stokes, the report is chock-full of valuable insight and while stating, as mentioned previously, that branded content offers brands the opportunity to differentiate themselves - "marketers are struggling to build content at scale -- to get the right message to the right consumer at the right time." As I said earlier, the report is full of great insight and this is perhaps the most powerful or telling. "Forrester defines branded content in the consumer marketing arena as: 'Content that is developed or curated by a brand to provide added consumer value such as entertainment or education. It is designed to build brand consideration and affinity, not sell a product or service. It is not a paid ad, sponsorship, or product placement.'" To me the most operative and vital words in the above are "designed to build brand consideration and affinity" and "not sell a product or service." It is very much a fine line a given brand walks when it comes to branded content marketing. 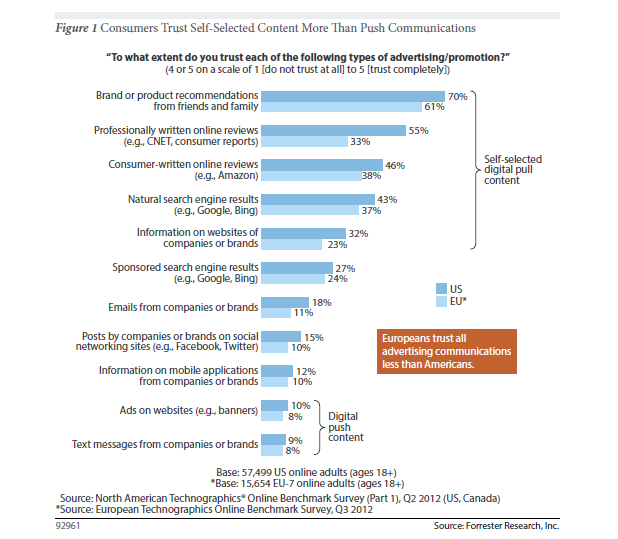 Just as the report itself states: "Branded content provides support to the brand when done right." In other words, branded content is not the place to go on and on about how great your brand is and how great your new widget is or anything even remotely tied to sales. A few weeks ago I wrote an article in Forbes This Just In: A Lot Of People Don't Trust Advertising. My tongue-in-cheek title aside, the article made reference to a study which showed that, well, a lot of people simply do not trust advertising. It was not my first and surely will not be my last article where the main component and underlying theme is a certain five-letter word: trust. The Forrester report touches on trust and sure enough it shows the same thing: people do not trust advertising - especially in Europe. What they do trust, however, is what their friends and family say about a given brand. And among their recommendations Forrester says marketers need to shift from random acts of content to purposeful storytelling. In other words don't just post and share content haphazardly. Have a plan, execute the plan and then measure the results over and over. And by all means, tell a story. But just not any story. Skip the ones that start out "Once upon a time there was a widget on sale for $9.99."